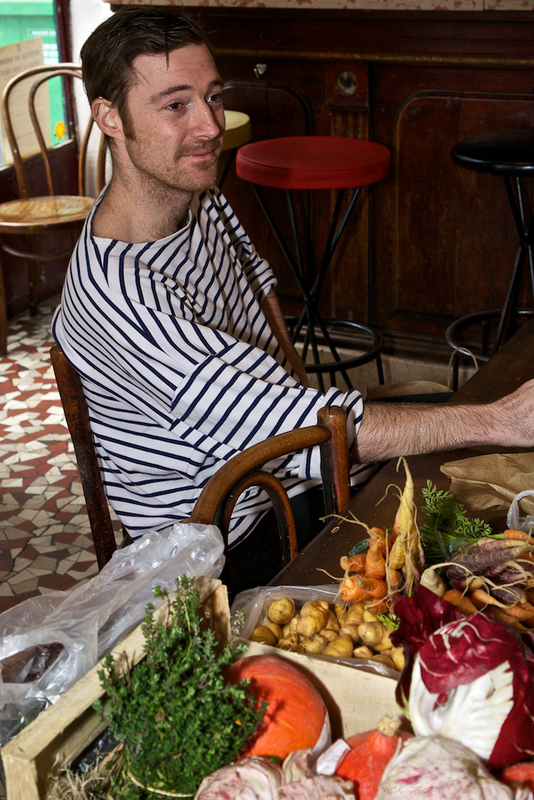 With Shaun Kelly, chef at the hot Paris bistro Au Passage, The Everyday French Chef inaugurates a new occasional feature: interviews with our favorite Parisian chefs. To kick off the series, I went to see Kelly on a recent afternoon. Young, edgy and ultracreative, he seems to be having a picnic in his first job fully in charge of the kitchen. 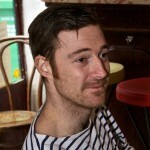 Aged 28 and originally from Australia, he has lived in Paris only since March. And despite his growing star power, this, he confided, is his first interview. Before moving to Paris, Kelly worked in London with the English chef Fergus Henderson, and is a firm believer in Ferguson’s ‘nose-to-tail’ approach to cooking – the idea that chefs should use every part of the beast, including the offal, and also every part of the plant, for example using the stems of dill in broths and the fronds as a garnish. The result is dishes that are not just delicious and beautiful, but ecological as well. In the interview, Kelly talks about his approach to food, where he finds his inspiration, and how he made his way from a tiny town in Australia to the capital of French cuisine. Site news: It is the French school holidays now and The Everyday French Chef is taking a break. We will be back on Monday with recipes with a Burgundy accent. In the meantime, I hope you enjoy the interview with Shaun. And happy cooking! This entry was posted in Et cetera. Bookmark the permalink.